It is often easy to tell when a child is overweight. Figuring out his body mass index can help make the diagnosis more official, but you often don't need to go that far. Instead, for most overweight kids, you can just use the more old-fashioned pinch an inch or two inches of body fat to know that your child is overweight. The hard part is knowing how to help your overweight child. Once a child is diagnosed as being overweight, his parents are usually given general information on improving his nutrition and encouraging him to be more physically active. Unfortunately, this advice hasn't helped the current child obesity epidemic much yet, and these kids often return the following year and have gained another 10 to 15 pounds. Having specific weight loss goals, in addition to more specific advice on how to eat healthier and how much more active they need to be, can be much more helpful. Surprisingly, the first goal that most experts recommend is not to go out and try to lose a lot of weight. Instead, they recommend a much more modest goal of simply not gaining any more weight. If you remember that your child is going to keep getting taller as he approaches and goes through puberty, it makes it easy to understand why simply not gaining weight can be helpful. Even if your overweight child isn't losing weight, as long as he isn't gaining weight or at least isn't gaining weight as quickly, he can slim out and reach a healthy BMI as he gets taller. However, this method only works for kids who are a "little overweight" though and haven't gone through their growth spurt yet. Other overweight kids will likely need to lose weight once they have reached their first goal of not gaining weight for a few months. Once your child has reached his goal of not gaining weight for a few months, you can set a new goal for actually losing weight. Again, it is important to set a modest goal so that your child doesn't get overwhelmed and give up. One pound each month is a good weight loss goal to set for most kids. Teens who are very overweight may need to lose even more weight, once they meet their initial goals, and may even move to a more aggressive goal of losing two pounds every month or even every week to get to a healthy weight. To help support your child through these goals and monitor his progress, set regular follow-up appointments with your pediatrician and/or a registered dietitian. Unfortunately, you don't just tell your child about these weight loss goals and watch him lose weight. It takes some work. Having goals can be a good motivator, though. How do you meet the first goal of not gaining weight? The first step is figuring out how much extra weight your child is gaining each month so that you know how many fewer calories he needs each day. For example, if your nine-year-old is gaining an extra three pounds a month, and each pound is equal to about 3,500 calories, then he needs to cut back on 10,500 calories each month to stop gaining the extra weight. While that seems like a lot, it works out to only 350 calories each day. How hard is it for a nine-year-old to cut 350 calories out of his diet each day? It shouldn't be that hard, but it gets even easier if you cut half of the calories from his diet (175 calories) and encourage extra physical activity to burn the other 175 calories (about 30 minutes of moderate exercise). Remember that you have to make these changes beyond what your child already does each day. That means that if your child is already exercising for 30 minutes each day, then he has to exercise 60 minutes a day for this to work. The child in this example could likely cut 350 calories from his diet just by cutting out of the high calorie, high sugar items that he likely drinks, including soda and fruit drinks, etc. You can also cut calories with a healthier diet, such as by eating less fast food, changing to low-fat dairy products, serving smaller portions, limiting second helpings of main courses, and eating healthier snacks. Once your child stays at a stable weight for a few months, you can go after the next goal of losing a pound a month. Since you already know that a pound of fat is equal to 3,500 calories, you know that you just have to cut another 115 calories a day from your diet to lose about a pound a month. 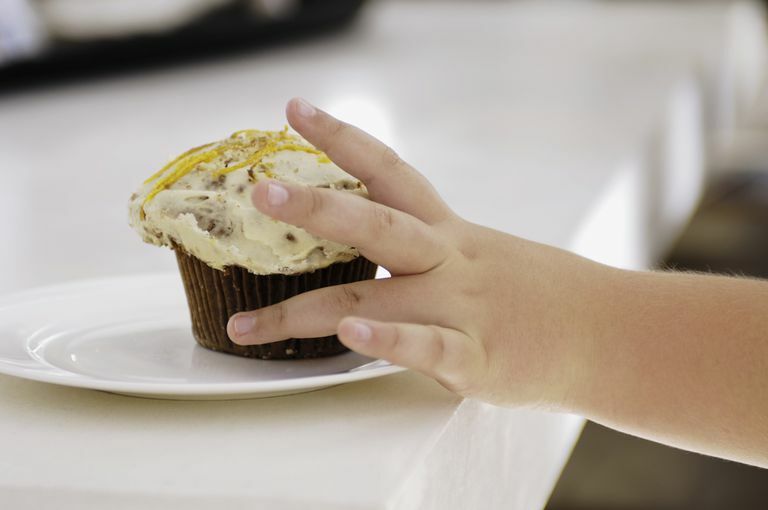 While you don't have to know where all your child's calories come from to help him meet his weight loss goals, it can help. For example, if your child chooses to eat three Oreo cookies (160 calories) after dinner instead of six cookies (320 calories), he would be saving the 160 calories if he normally eats six cookies each day. If he usually doesn't eat any cookies, then those three cookies would be extra calories. If you can't have strict calorie counts, try keeping a drink diary to record general trends in your child's eating habits, like how many calories he gets from snacks, etc. You may find that he is getting an extra meal's worth of calories from a big after-school or bedtime snack. If even not gaining weight seems like too high of a first goal, then perhaps start with slower weight gain as your first goal. So if your child has been gaining two pounds a month, set a goal of only one pound a month of weight gain for a few months. Encourage healthy eating and a healthy weight instead of pushing "dieting" on your child. Getting the whole family involved in eating healthy and being more physically active can greatly help kids stick to their weight loss goals. The fact that children normally gain about four to five pounds a year, which can increase as a child nears puberty, can complicate your child's weight loss goals. Most overweight children don't necessarily need this normal weight gain though. American Academy of Pediatrics Policy Statement. Prevention of Pediatric Overweight and Obesity. PEDIATRICS Vol. 112 No. 2 August 2003, pp. 424-430. Pediatric obesity epidemic: treatment options. Kirk S - J Am Diet Assoc - 01-MAY-2005; 105(5 Suppl 1): S44-51.